Kendall Excilon Drain and I.V. Sponges are non-woven pre-cut T-slit drain and I.V. sponges. They provide superior absorbency and fast wicking action to help reduce infections and decrease the frequency of dressing changes. The unique pre-cut T-slit design conforms snugly around drains, catheters, chest stubs, I.V’s and tracheotomies. They keep the dressing in place and site secure without fraying. They feature a diamond pattern limits unwanted adhesion to prevent trauma. The exclusive tri-laminate polyester-rayon-polyester sandwich design limits unwanted adhesion to tissue to prevent trauma. 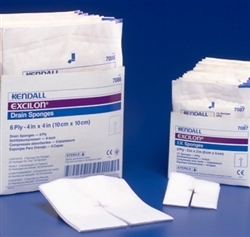 Excilon Drain and IV Sponges are sterile and have pre-cut T-slits to eliminate the need for trimming with sterile scissors. Made of garment grade polyester to limit dressings adhesion.